It’s a most sacred task, but someone has to do it. 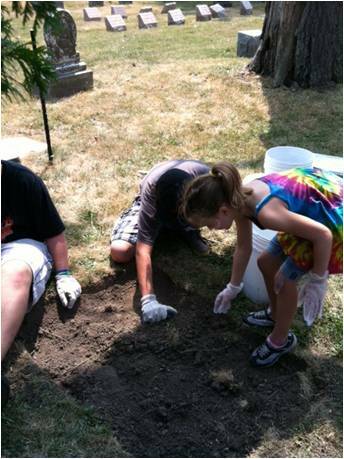 About a year ago, two young boys from Niagara Falls uncovered the grave of Willie Richardson. Just a little fist-sized section had surfaced and it bothered the boys that a person was being swallowed up into the earth. So they used whatever makeshift tools they could find and peeled back the earth and grass until Willie was revealed. He died in 1864. Not much is known about Willie to this day. We know his father was a guide on the river. We know he was buried in Oakwood. That’s about it. But he will always be Brendan Kratts’s and Jason Hake’s favorite resident at Oakwood Cemetery. They feel that, in a way, they resurrected someone. For one person who had lived a very long time ago had almost disappeared but now he is remembered. The story of Willie Richardson hit the newspapers and the boys decided to make uncovering lost souls their sacred task and the Cemetery Stone Investigators (CSI) were born. They have found other missing persons, too, including Rachel Preston Parsons—who was born in 1765, and Lolly Todd Childs who may be a relative to Mary Todd Lincoln! 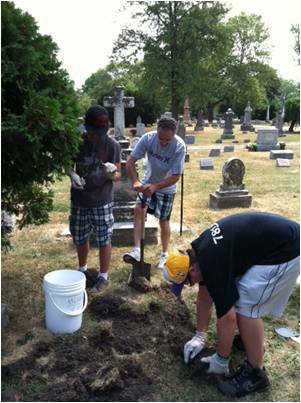 On Sunday, July 22, 2012, the CSI (Cemetery Stone Investigators) at Oakwood Cemetery set out on Day #1 of a very important mission: locate the graves of The Three Sisters and Little Brother. 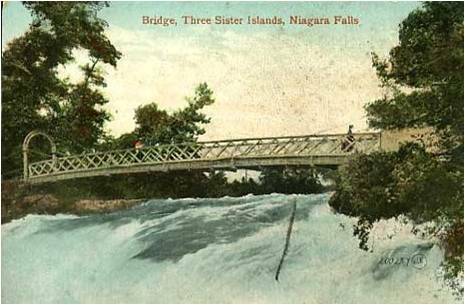 The Three Sisters and Little Brother, refer to the Whitney children—the real people behind the names of the world famous islands at the brink of the Horseshoe Falls. Local lore reveals that back in 1816, General Parkhurst Whitney, a founder of Niagara Falls and a hero of the War of 1812, ventured out to the little islands as an ice bridge had formed during that infamous “year without a summer.” Because of their precarious position the islands that teetered at the edge of the cataract were virtually impossible to get to until the ice created a natural bridge that one year. The Whitney girls were the first white girls to ever step foot on those islands and somewhere along the line it was decided to name the islands after them: Asenath, Celinda Eliza and Angeline. The smallest island on the outskirts eventually became known as “Little Brother,” after their little brother, Solon Whitney. A vintage postcard showing the Three Sisters IslandsUnfortunately the Whitney graves have experienced the same fate as many other 150 year old graves. Time has not been kind and they have not easily weathered the storms of three centuries. Asenath, born in 1809, faired the best of the sisters. Her tombstone, though modest for her place in society, still stands. 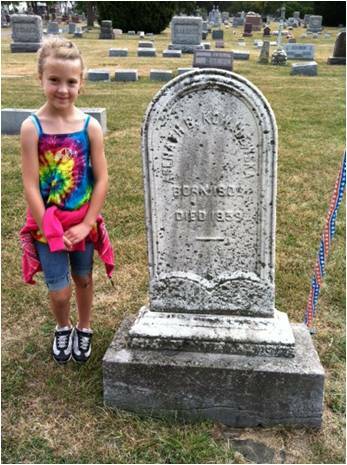 Jillian Kratts, who portrays Asenath in our Stunters Tours, was more than happy to pose for a picture beside her grave. 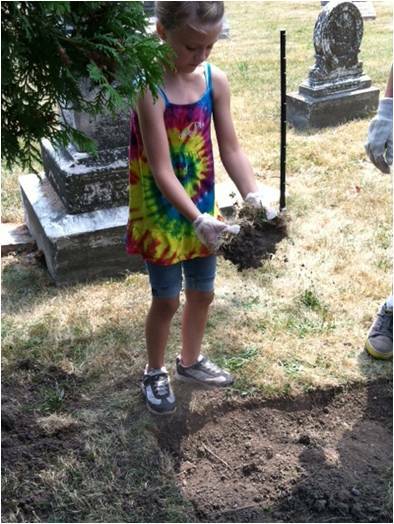 She helped her brother, Brendan, and his best friend, Jason, as they gathered their shovels and buckets and set out to uncover the latest history mystery in Oakwood Cemetery. Luckily, Asenath is quite readable, though she stands unprotected in Lot #62 under a hot sun with not a tree in the general vicinity. Jillian Kratts, who portrays “Asenath Whitney” in Oakwood’s, Where the Stunters Rest tour, poses beside the grave of Asenath Whitney. If you have visited the Three Sisters Islands, Asenath was the namesake for the first island you stepped foot upon. It was also known, at different times, as First Sister Island and Moss Island. There has always been a bit of controversy as to when the islands became officially known as the Three Sisters Islands—different historians will give you a different story. We do know, however, that today, the first island is Asenath, and we do know that Asenath, the woman, lies in her grave at Oakwood Cemetery. Asenath was born on January 22, 1809, in Geneva, New York, the first surviving daughter of General Parkhurst and Celinda Whitney. Interestingly the most unusual name “Asenath” is Egyptian in origin and means “she belongs to her father” or “gift of Isis.” Likewise, Niagara’s Asenath was not your ordinary woman. She was only one year old when her parents came to the wilderness that was Niagara Falls. Her father worked as a surveyor and was the first to plot out Goat Island. Asenath, whose father also created the first library in Niagara Falls, was a brilliant and highly educated woman. She was a scholar and a linguist and was fluent in a number of languages. In 1822, her father brought her a very special and historic gift—a piano. It was the first piano in Niagara Falls and Asenath soon after became an extremely accomplished musician. Her courtship and marriage in 1837 was something straight out of a fairy tale, for the dreamy Asenath met and fell in love with a Polish gentleman and teacher of languages named Count Piotr de Kowalewska. An officer with the 10th Lithuanian Lancers and a noble man who was forced to flee his homeland following the Revolution when his estates were confiscated, the count brought some new exotic and romantic flair to the family. Four children were born to the Kowalewska’s: Linda Alice, Olympia, Frederic, and Helena. All of them were gifted in music, the arts and languages. Asenath died on September 6, 1859, and was buried here, in Oakwood Cemetery. She is beside her parents’ broken down graves; Celinda and Parkhurst Whitney languish to her right. Her husband, the Count, died in Havana, Cuba, in May of 1854. We are not sure at this point if he is buried in Oakwood or not. Another history mystery for another day! Although we know that all three sisters (and little brother) are buried in Oakwood, Angeline’s grave has proven to be much more of a challenge for the CSI. A scorching sun baked the already blanched grounds this Sunday morning as Oakwood historians Pete Ames and Dorothy Rolling searched over the old yellowed maps for the grave of the second sister, Angeline. It became apparent that all signs pointed to the fact that Angeline is buried not too far from her parents and her sisters and brother in the Dexter Jerauld Lot. According to the books, she is buried in Lot 64 somewhere beside Louise Jerauld (who was partially hidden behind a tree and quite blanched herself) and directly in front of the monument for Harriet and Dexter Jerauld. A penciled in note revealed a not so pretty fact: “marker not good.” There was no marker to be seen for our poor Angeline. Where can it be? Jillian looking for possible remnants of Angeline’s stoneThe CSI wasted no time at all. They marked out the spot where she was plotted to reside and Pete began to dig. 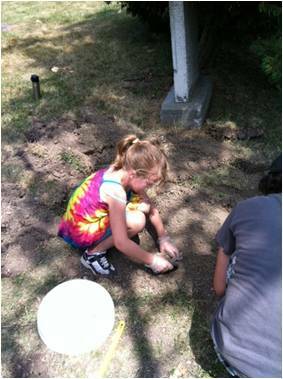 The CSI team dug deeper and sifted thru the dirt and clay. Red ants climbed up their legs and as they wiped the sweat from their eyes it became apparent that this was not going to be easy. Their excitement would peak each time their shovels hit against a piece of stone. Unfortunately they were all broken pieces of stone. They separated the stones from the dirt and vines and grass. Sifting through those pieces will be a job for another day. Finally several unusual pieces of stone surfaced. These larger chunks may in fact be pieces of Angeline’s tombstone, for there was evidence of concrete on these stones. 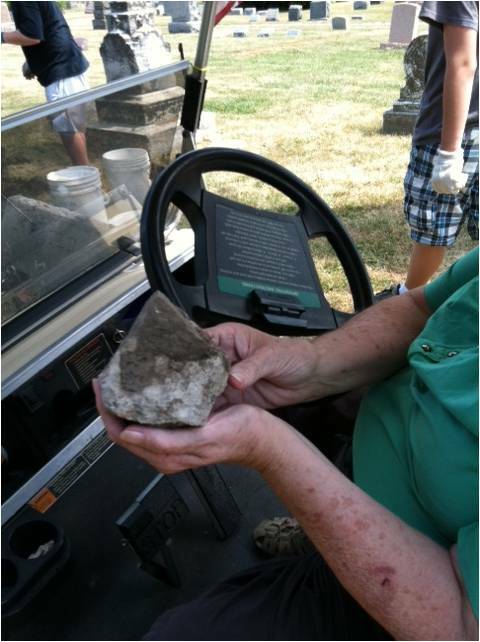 Dorothy Rolling, town of Niagara historian and an expert on cemeteries, knew that there was no other reason for random concrete and stone that far down into the earth. It must be part of a stone that had been pieced back together at one point. If only a piece can be found with some lettering. 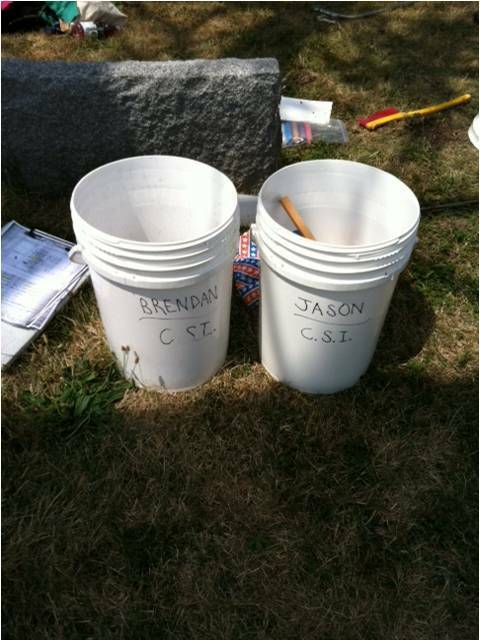 After several hours of hard work, it was time for the CSI to pack up. Hopefully Day #2 will bring us closer to the final remains of Angeline Whitney! 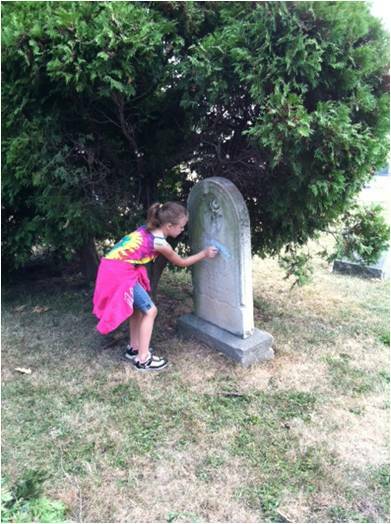 Look for our next installation of CSI’s search for the Three Sisters and Little Brother and the story of Angeline Whitney Jerauld.